I listen to Steve Reich a lot, mainly his second-half-of-the-70s output. It's great to either really listen to, or have on as background music while writing. But my current favourite of his wasn't actually released by Reich, is barely recognisable as his and he may not even know it exists. It's Section I of Music for 18 Musicians, slowed down 800% and therefore stretched to 44 minutes. 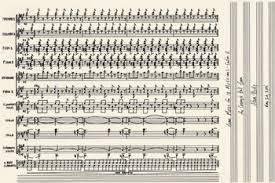 At that speed it sounds like a lot of ambient drone stuff, including Eno's Discreet Music, but there's something about this piece (here on You Tube) which makes me play it over and over. It helps, of course, that the original, unslowed-down composition is possibly my favourite piece of music ever. A beautiful gentle drone. The original is basically unrecognizable. Thank you for the great find!